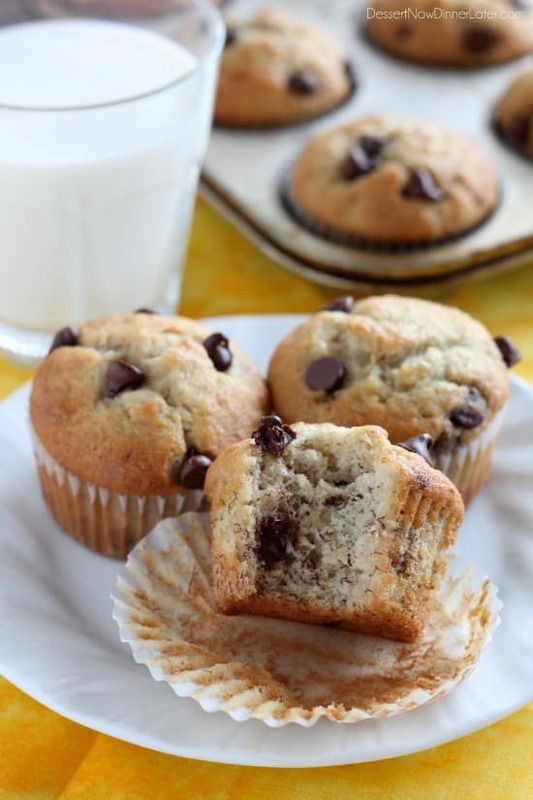 Banana Chocolate Chip Muffins - Dessert Now, Dinner Later! I rarely have bananas sitting on my counter getting brown and mushy, because I have a smoothie every day for breakfast and I put a banana in each one because it makes it thick, and creamy, and I like it. So when I somehow ended up with brown bananas (I think it’s because I had some Kashi cereal for breakfast for a few days in a row instead) I jumped on the opportunity to make some Banana Chocolate Chip Muffins. They turned out beautiful! Brown on the edges, nice tall peaks, and polka dot chocolate chips decorated the tops. Perfection! There are tricks to getting these kinds of results when baking muffins (or cupcakes) at home, and I’ll tell you what they are. Tip #1: Don’t overfill your muffin cups. The general rule is 2/3 full, not 3/4 full. There is a difference, believe me. This gives the muffin time to cook and get solid before it reaches the top of the paper cup and spills over. Tip #2: Bake at 400 degrees Fahrenheit. I hate those recipes that say bake at 350. Not good! You want your muffins to shoot up quickly and create that peak, which kind of contradicts tip #1, but since it’s baked at a higher heat, it’s cooked enough when it reaches the top, and it won’t spill over. 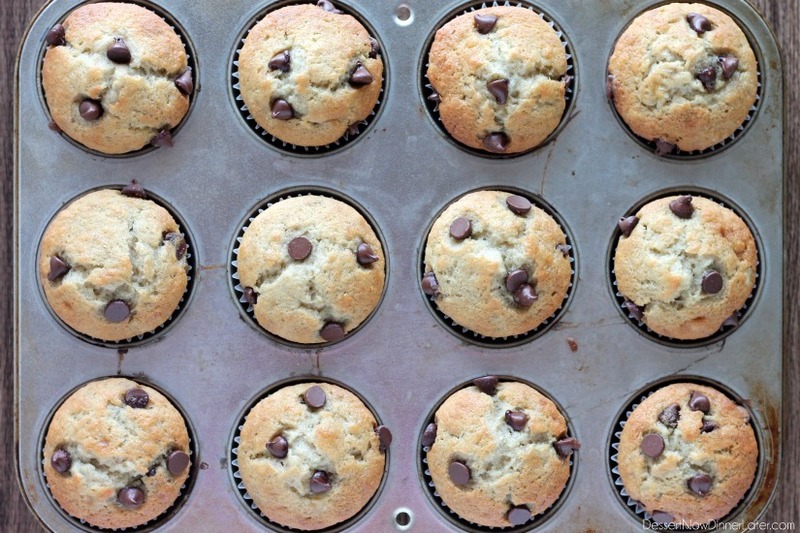 Tip #3: Use no less than 1 tsp of baking soda for a 12 (ish) muffin recipe. The baking soda helps leaven the muffin giving it that peak with the help of the higher heat of the oven. And when I say 12 (ish) muffin recipe, I mean, the recipe I altered for this post said 24 muffins; I cut it in half and got 18 muffins because I didn’t overfill my muffin cups. It might have had to do with the fact that it said 2 to 3 bananas, but they preferred 3, so I used 3, which means more batter, but that’s quite a bit more that 12 muffins, yeah? Seriously though, these look good, but they taste good too, and now that you know some secrets to muffins, you can get to baking! In the bowl of a stand mixer, mix the bananas and sugar until the bananas are mostly smooth (not too chunky). Add the vanilla, sour cream, eggs, and oil. Mix until combined. In a separate bowl, combine the flour, salt, and baking soda. Add to banana mixture until incorporated. Fold in ½ cup of the chocolate chips. 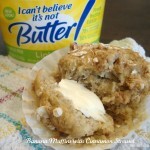 Spoon muffin batter into prepared muffin tins with paper cups, ⅔ full. Sprinkle remaining ¼ cup chocolate chips on the tops for good looks. Bake at 400 degrees Fahrenheit for 18 to 20 minutes until golden brown on top and edges. Thanks for the tips and the good looking muffins. You’re welcome and thanks for your compliment! 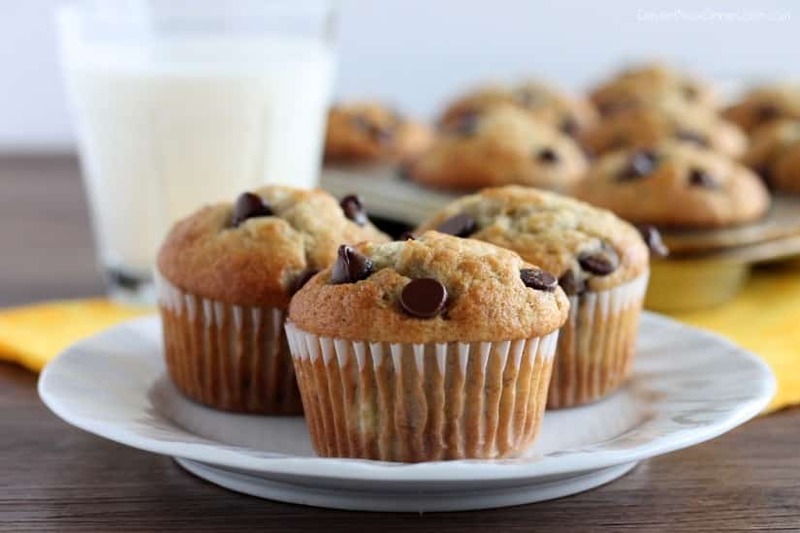 These muffins look just perfect! Thank you! I hope this post helps you get perfect muffins as well! What gorgeous looking muffins! Thank you for all the wonderful tips. Thank you Jen! Hope the information is useful for you! 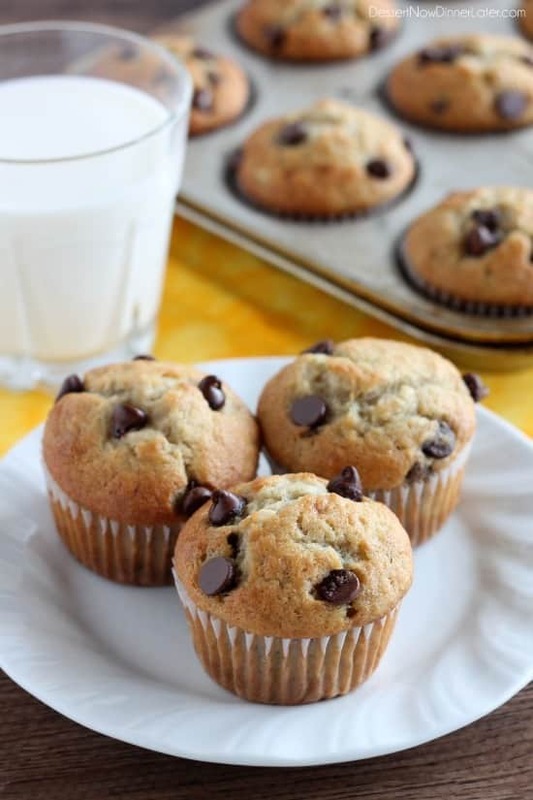 I love the addition of chocolate chips to these banana muffins. Such a cute breakfast idea! Thanks Julie! We loved them! Thank you! I love it when they turn out perfectly round on top! Mmm! These muffins look perfect! Thanks for the tips! Thanks Becky! Hope the tips are helpful! These are quite the gorgeous muffins! I can just picture how awesomely these would go with my cup of coffee this morning. 🙂 Love it! Pinned. Thanks Sarah! 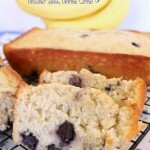 They are delicious for breakfast, snacks, or dessert! Thanks Rose! Hope you enjoy! 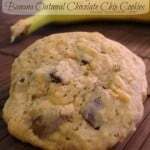 Making these right now with my brown bananas (that I was just about to throw away). My bananas and I thank you! I’m excited for you! I hope you love them! Thanks Kristine! Sure, you can use greek yogurt or extra oil. I have subbed mayo for sour cream before. Not in this recipe but it was another baking recipe and it worked great. These muffins look SO yummy. I can’t wait to try them. I think I am going to try them with pumpkin spice chips. Great idea! (subbing mayo for sour cream) I’ll have to try it! 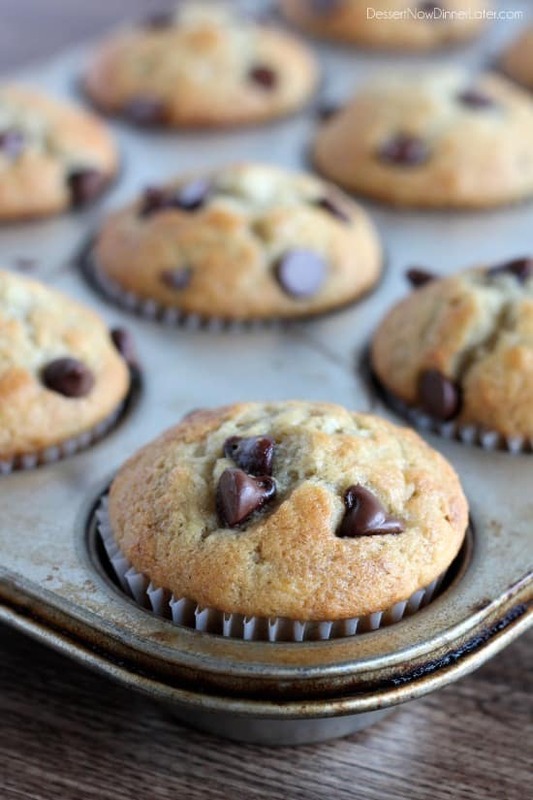 Pumpkin spice chips sound like a great addition to these muffins! Hi Amber, would this recipe still work for making a loaf instead of muffins?? For sure! It will take longer to bake, maybe closer to 30 or 45 minutes depending on the loaf size. Enjoy! 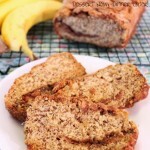 Have you tried this with gluten free flour? My son has food allergies but I want to try them. I just tried your recipe this evening and they turned out superb! Those muffins were beautiful, moist and delicious! I accidentally forgot to add the eggs but they’re still soft and fluffy. I am definitely gonna use this recipe again and again. Thanks a lot Amber! Whoops! Glad they still turned out okay without the eggs. I’m really happy that you enjoyed the muffins Elle! Hahaha! Love it! Yep, whole wheat flour would be why they are darker. So glad you liked these Amanda! 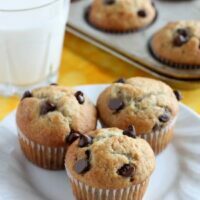 These muffins are delicious! We’ve made them many times now. How would you adjust the time/temperature for mini muffins? Should I shorten the time and bake at 400 or decrease the temperature? I’m so glad you like the muffins! I would probably decrease the temperature to 375 degrees and start checking them at 10 minutes. Good luck! Hi there! How would you alter this for high altitude? I’m at 6500 feet up. Thanks!! I’m at 4500 feet, so pretty high up. You should be able to make the recipe as is. You can decrease the baking soda to 3/4 tsp and add 2 Tbsp more flour if you are nervous, but the higher oven temp and everything should work as is. Let me know how it goes! If you wanted to substitute the sour cream with buttermilk in this recipe, that should be fine since it’s a small amount. If you were substituting a whole cup of sour cream you would have to make more adjustments though (i.e. add butter). Google how to substitute buttermilk for sour cream. Enjoy the muffins!